Our family room has come a LONG way. See the "before" pictures below. 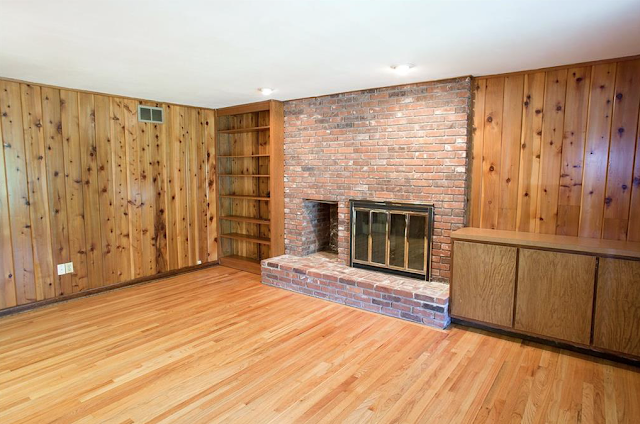 Since September we have painted the knotty pine wood walls and ripped out the awkward built ins on the right side of the room. We also took out the glass fireplace guard, reworked the curtains and built a mantle. 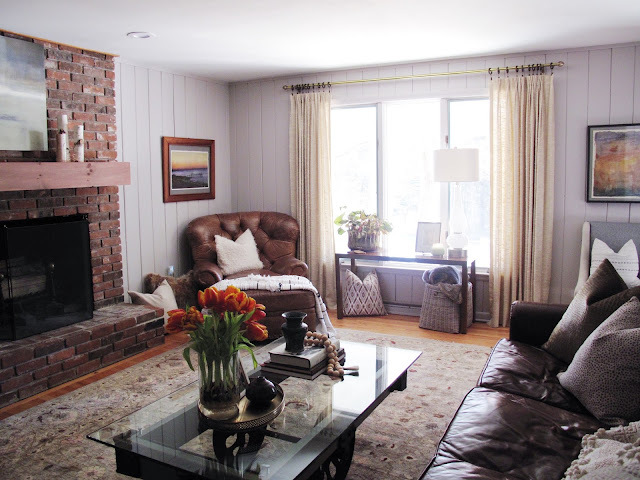 The knotty pine walls were primed and painted in Farrow and Ball's Peignoir paint color #286 and we chose the Modern Eggshell. 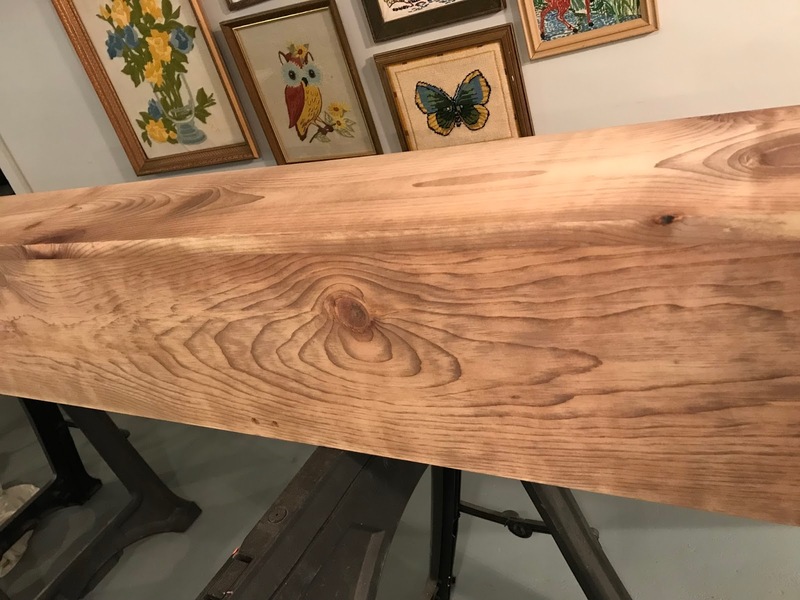 My husband built a floating mantle out of white pine and we tried our "go to" wood stain solution of vinegar and steel wool to stain the mantle. We have used the DIY vinegar solution in the past to "weather" other woods but it was not working this time. After multiple failed attempts, we were tired of the vinegar burning eyes stench, we decided to try a professional stain! 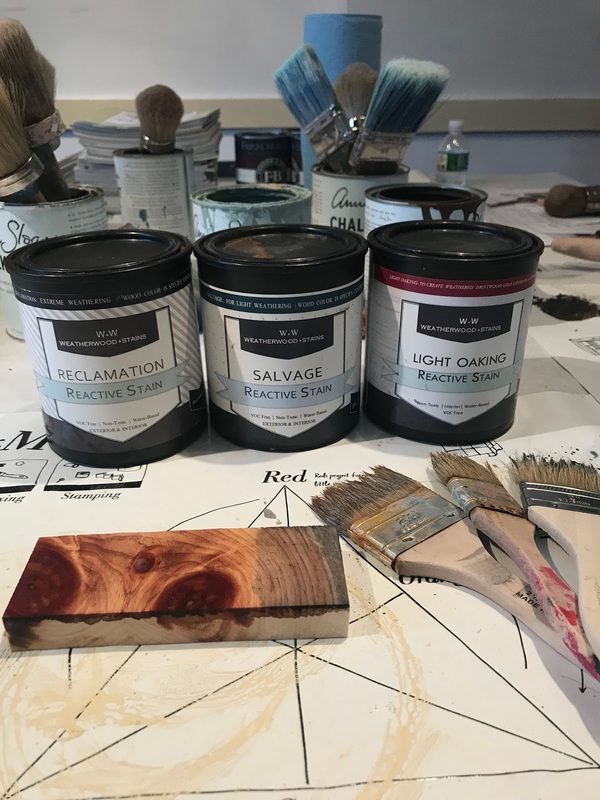 We picked three Weatherwood stain options, at Thomas Mach Interiors workshop, and tested them on our sample wood. The samples dried quickly and went on easily. 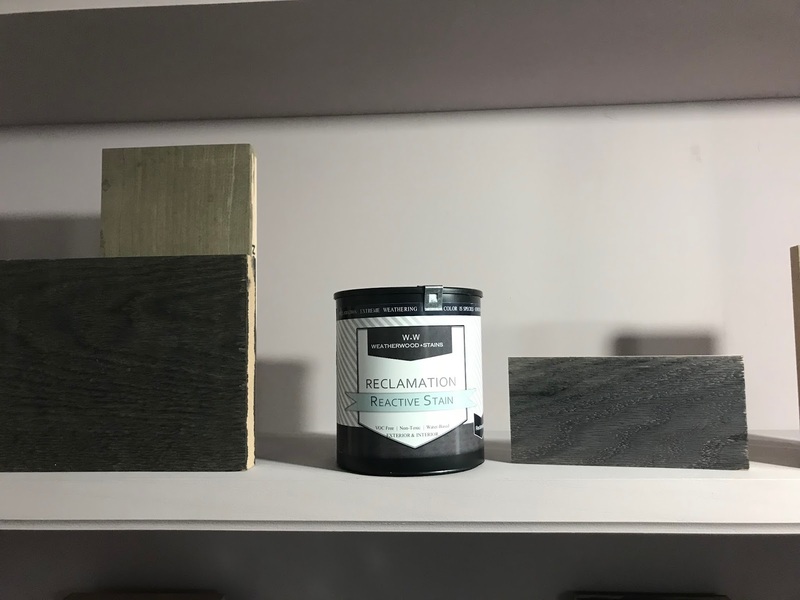 We wanted a driftwood look- these are the sample wood pieces at Thomas Mach Interiors Shop so we went with the stain "Reclamation" By Leatherwood Stains. Why a boutique brand stain? Because Weatherwood Stains has wood stain colors you can not find from other brands. Also, the stain penetrates the wood versus other stains that merely apply a top coat color. This one reacts with the tannins in the wood producing a natural aged look based on the wood you are using. 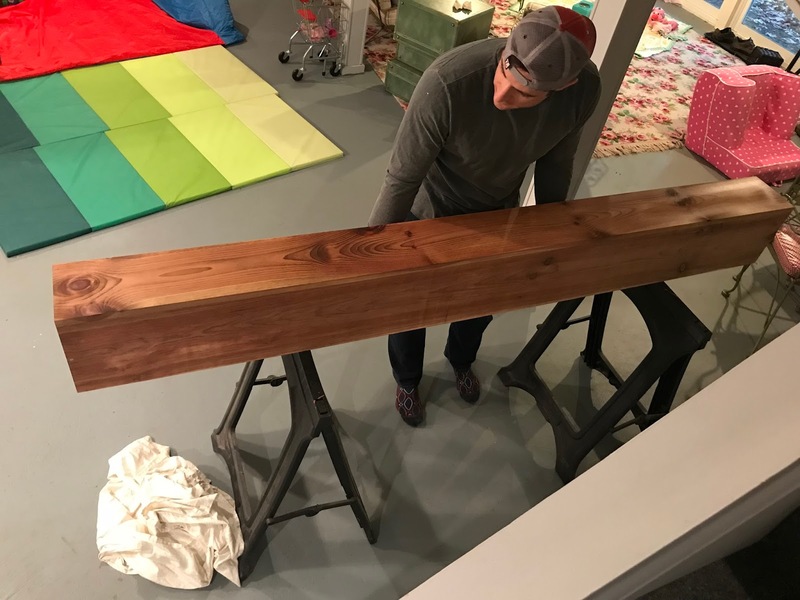 Plus, it's easy- Sand the wood, Wipe the stain on and Wait for it to dry. Voila! 100 years of age in less then 10 minutes! DONE! 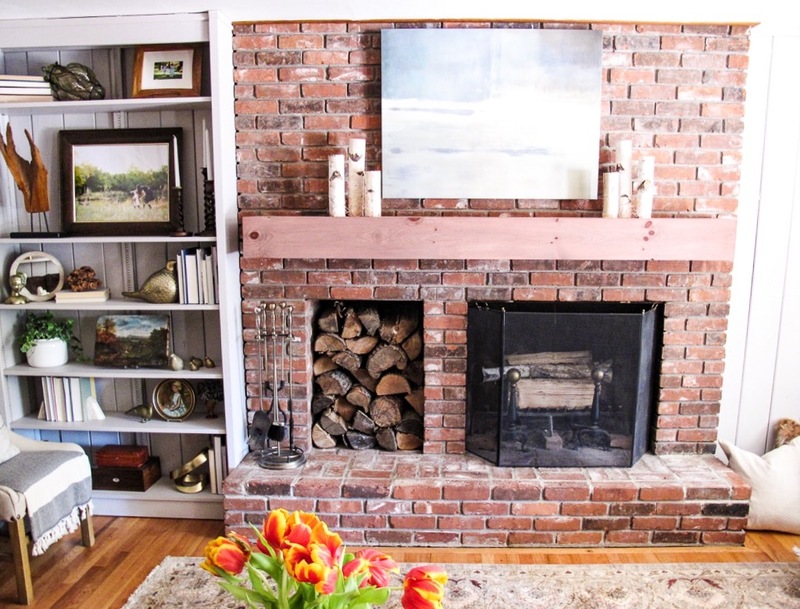 The mantle was removed from the fireplace (since we are also painting the brick) and sanded. Otherwise, we would have left the mantle attached to the fireplace while staining. Now we wait for it to dry! Like the workshop/ playroom ha ha! 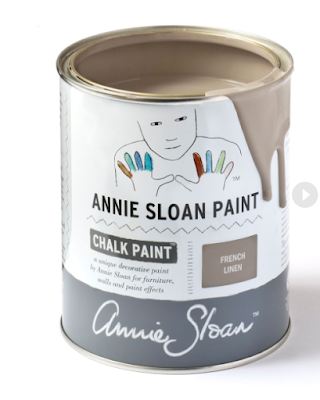 We will most likely apply two coats. * The stain used in this post was sponsored however all the thoughts, tips and opinions are my own! Welcome Back! It's REVEAL WEEK on the Primp & Pamper Bathroom Refresh Blog Hop and I can't wait to see each participants final touches!! 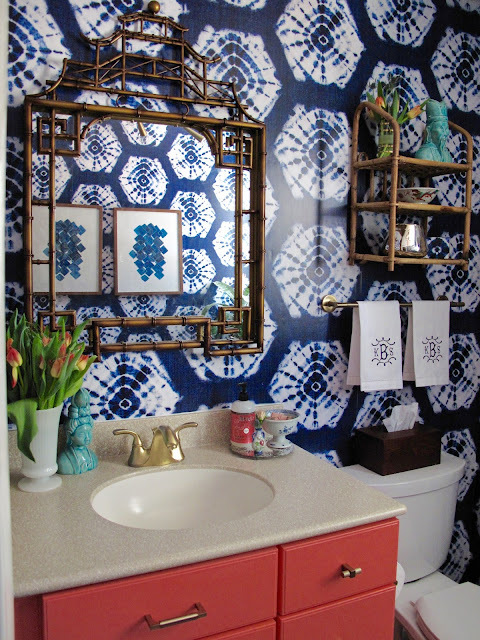 Thank you to those of you hopping over from My Eclectic Nest- isn't Tiffany's reveal stunning!?! This month has been a wild ride with transforming our powder bathroom. 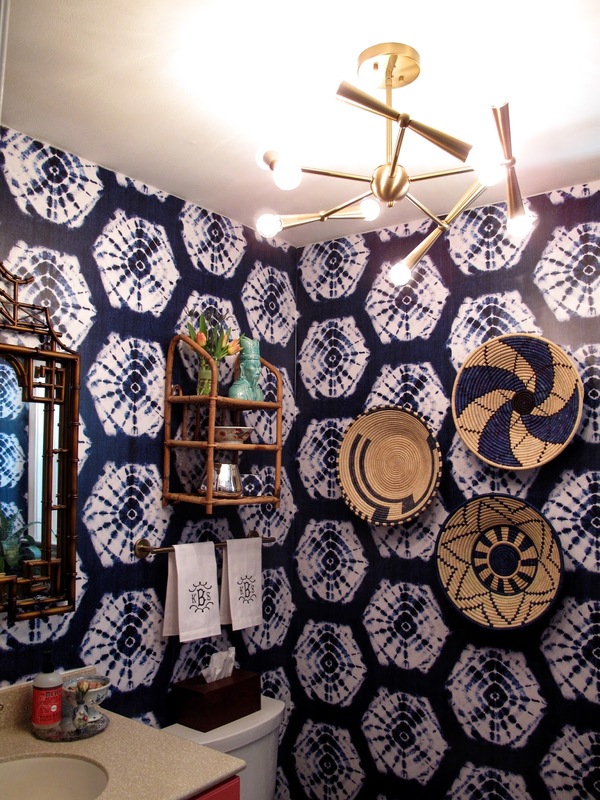 All of this would not have been possible without our lovely host: Jewel at Jewel Interiors. 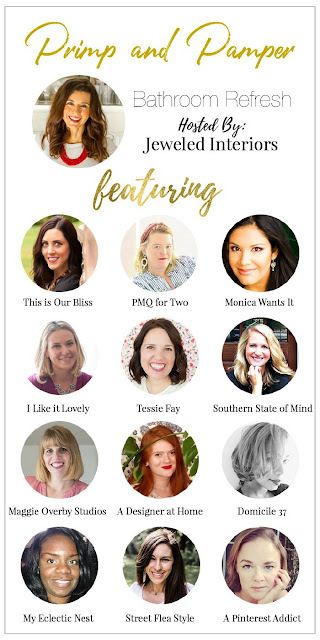 She has done an amazing job of gathering us bloggers and sponsors together. Thank you so much Jewel!!! Ta da!! 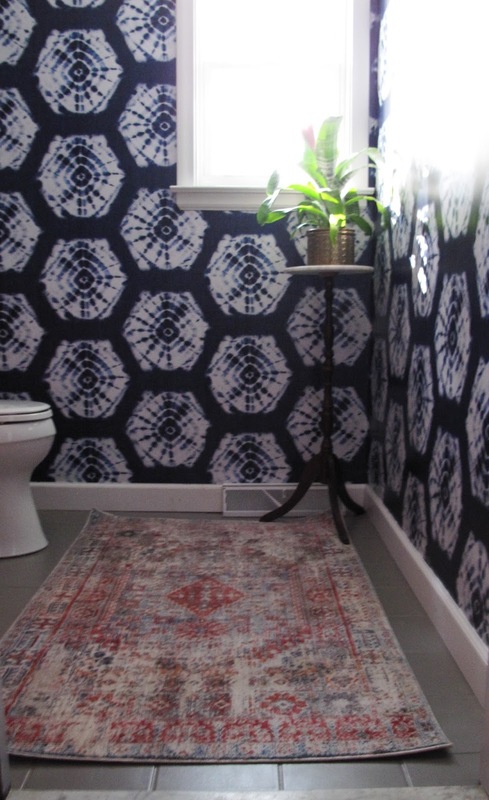 The new view when you enter our powder bathroom! 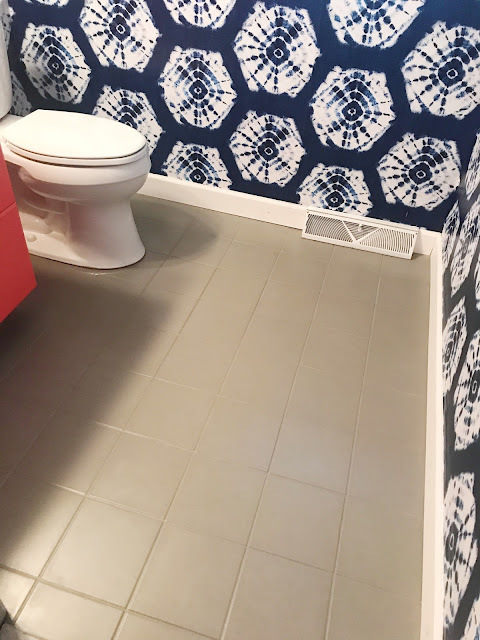 My favorite part of the refresh process has been walking down the hall seeing this updated room and knowing that I now have a clean and presentable bathroom. Gone are the days of bare walls and dirty beige tile! The Lighting was a major update this week. Moving the light fixture from the wall to the ceiling was a game changer. The original 3 light sconce, that hung over the mirror, was casting a large shadow in the room and really only lighting the vanity. As you can see, we now have this warm brass 10 Light Sputnik Chandelier that gives off just the right amount of light. It's not overpowering. I fell in love with it when I saw it on Lamps Plus, they have tons of lighting options, so the choice was difficult. At first, I was worried it would be too bright with 10 bulbs but we used 25 watt bulbs (max is 40 watt) and it's the perfect amount of light for the space. The set of three African baskets were a recent Home Goods purchase. I usually like to find them while out thrifting but finding three matching baskets, all at once, in the right color scheme had me sold. Home Goods for the win! It was fun to add all the little details to accent the room. 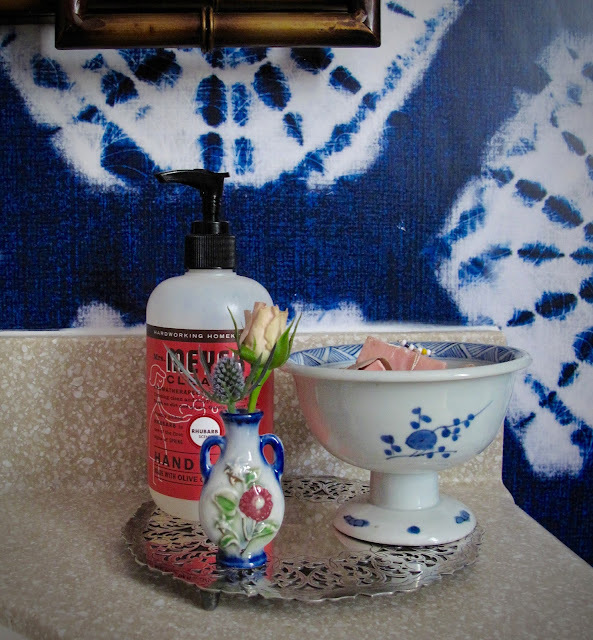 I purchased these stunning embroidered hand towels on Etsy HERE. The shop owner shipped them super quickly and they are even prettier in person! I found the rattan shelf at Goodwill as well as the glass vase and candle. 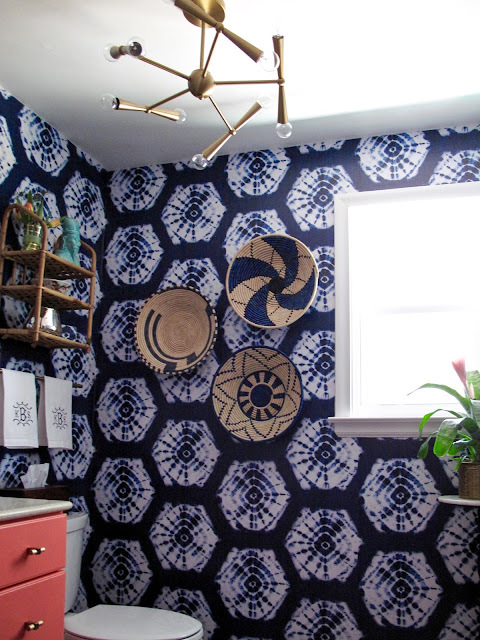 I used leftover wallpaper scraps to "pretty up" and old box of matches and brought in my asian man and dragon bowl for fun accents. 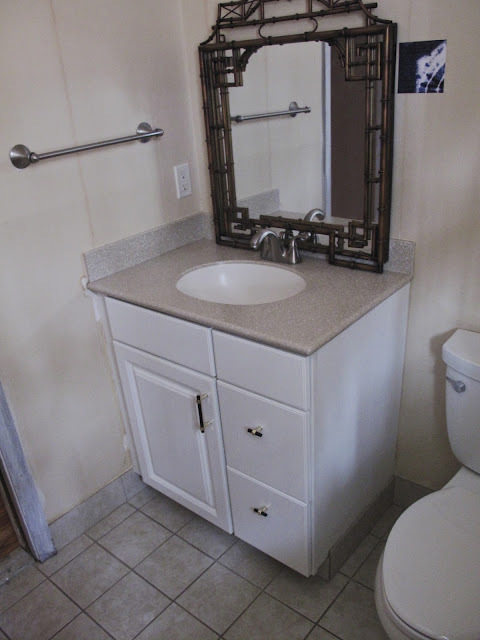 We decided to spray paint the faucet gold so it worked with the hardware and mirror. 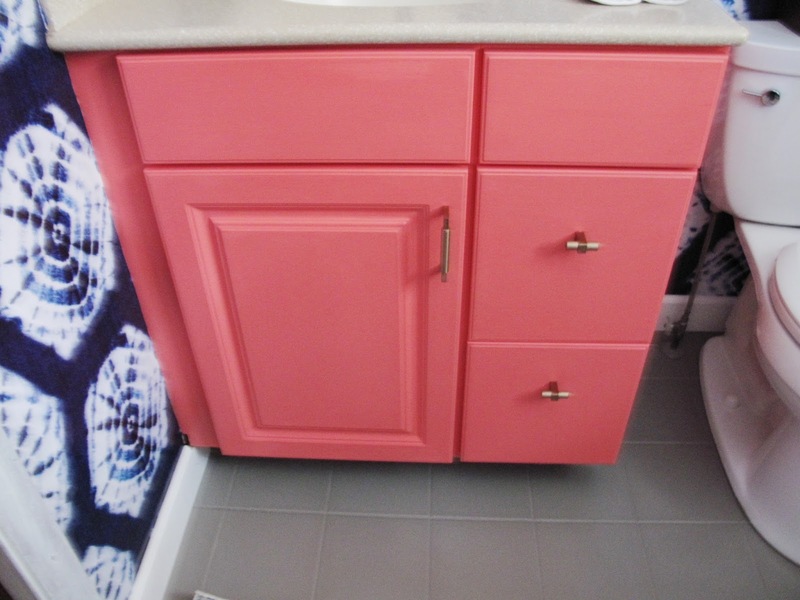 I wanted to try spray paint since we were not ready to replace the counter top, sink and faucet. The Asian bust was an estate sale find and I picked up the floral vase at Goodwill today. The hardware, thanks to Liberty Hardware, was a huge facelift for the vanity. Wanting a piece with more character I was tempted to replace the vanity BUT the hardware really gave it the look it needed. 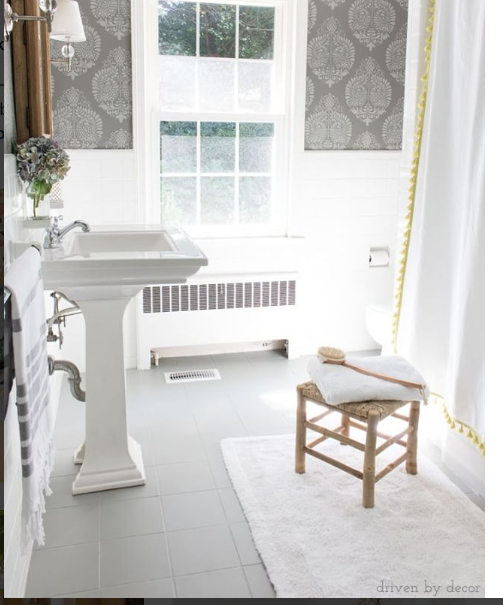 The Delta Trinsic collection towel bar and tissue holder, from Liberty Hardware, are also a lovely upgrade for the room. 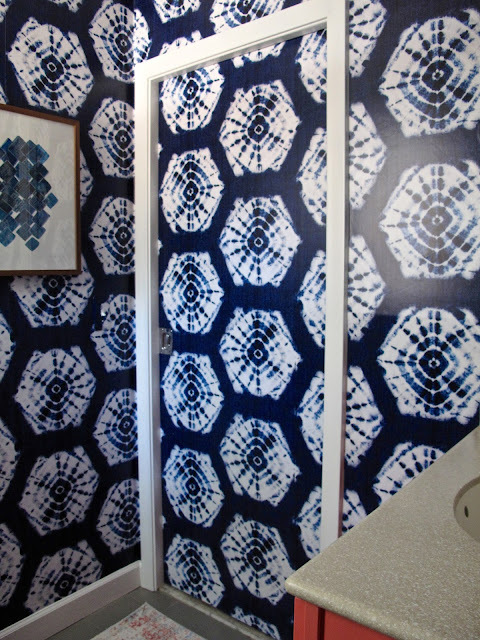 A last minute addition was wallpapering the bathroom door. It's a pocket door and was stained a brown 1970's oak color. 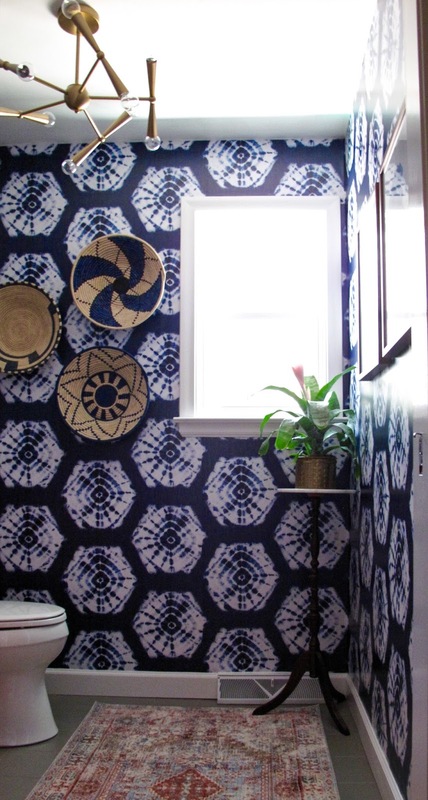 I loved the idea of the door flowing with the room and thankfully we had just enough wallpaper to make it happen. A final look at the floor- we are thrilled with how the Annie Sloan Chalk Paint turned out- you can find the paint HERE the lacquer we used to seal the floor HERE and the sponge roller we used to apply it HERE. It gives the room a clean warm feeling. 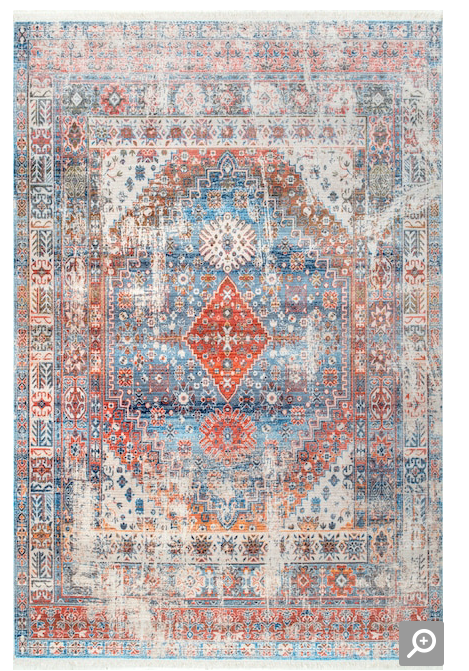 The rug truly brings all the colors of the room together and adds a soft texture. The RUGS USA rug (is on sale!) can be found HERE. 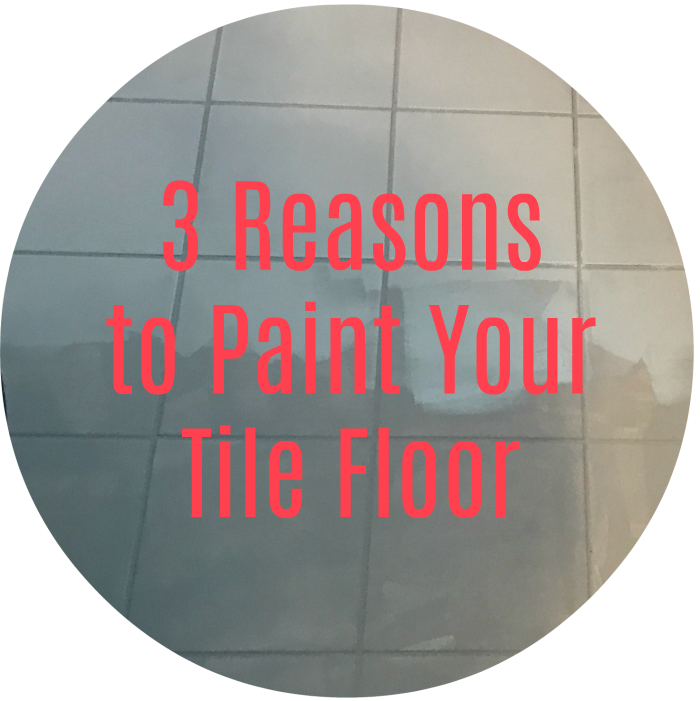 Our tile paint tutorial can be found HERE - we have had no issues with wear and tear thus far. Finishing out the hop is Eliesa at A Pinterest Addict. You have to see her floral wallpaper! Check out the other participants fantastic reveals! You won't want to miss a single one! Thank you again to our lovely sponsors below. 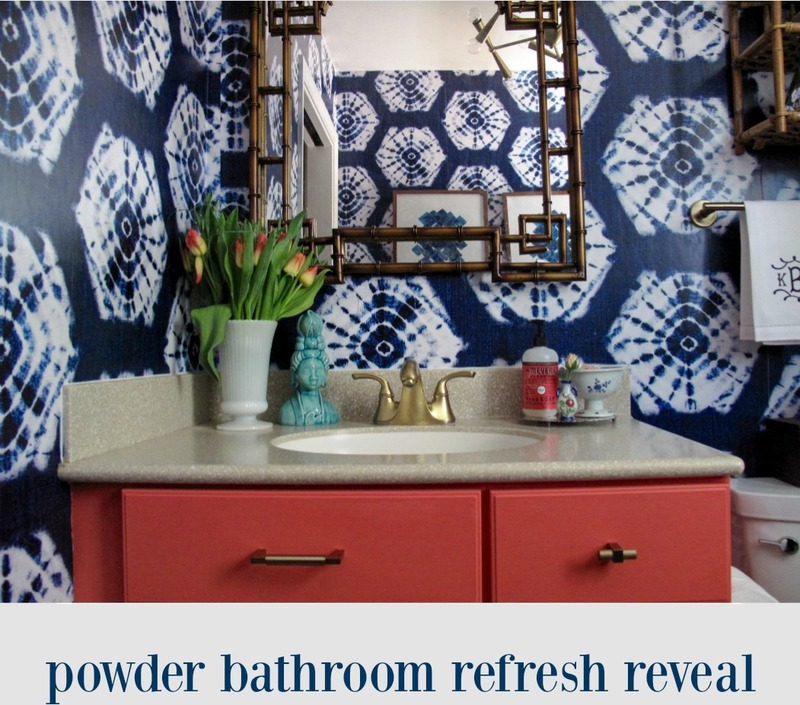 While some of the items in my powder bathroom refresh were sponsored all the thoughts and opinions expressed here are my own. 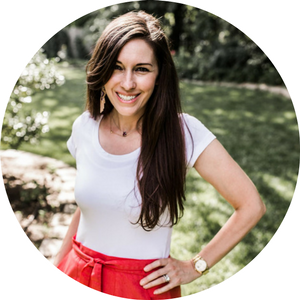 If you're hopping over from Tiffany's post at My Eclectic Nest, Welcome! 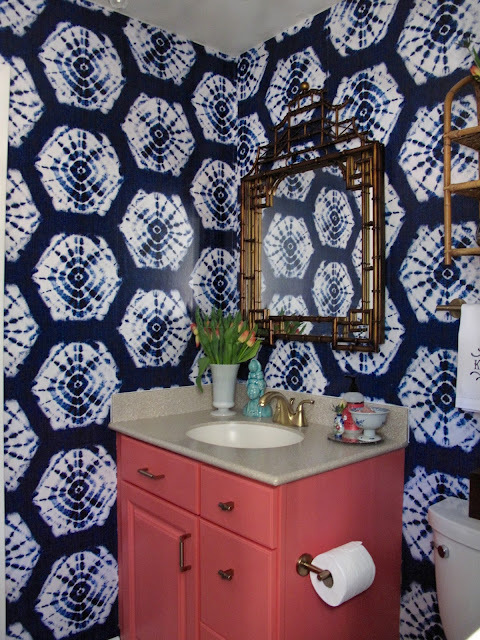 Isn't fun to see how paint has transformed her bathroom?? 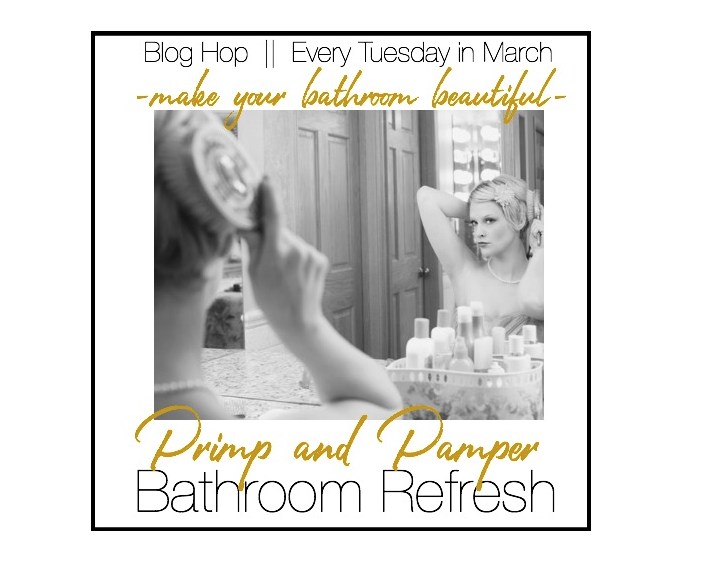 It's Week 3 of the Primp & Pamper Bathroom Refresh and I can't wait to talk paint! A huge Thanks Jewel at Jeweled Interiors for hosting this fun hop! Instead I was inspired by the below photo to paint the floor instead. 2. Time- about 3 hours of actual painting; start to finish was 12 hours. Having the room re-tiled would have taken 2-3 days. 3. Ease- no demolition. no design. no contractors. easy! 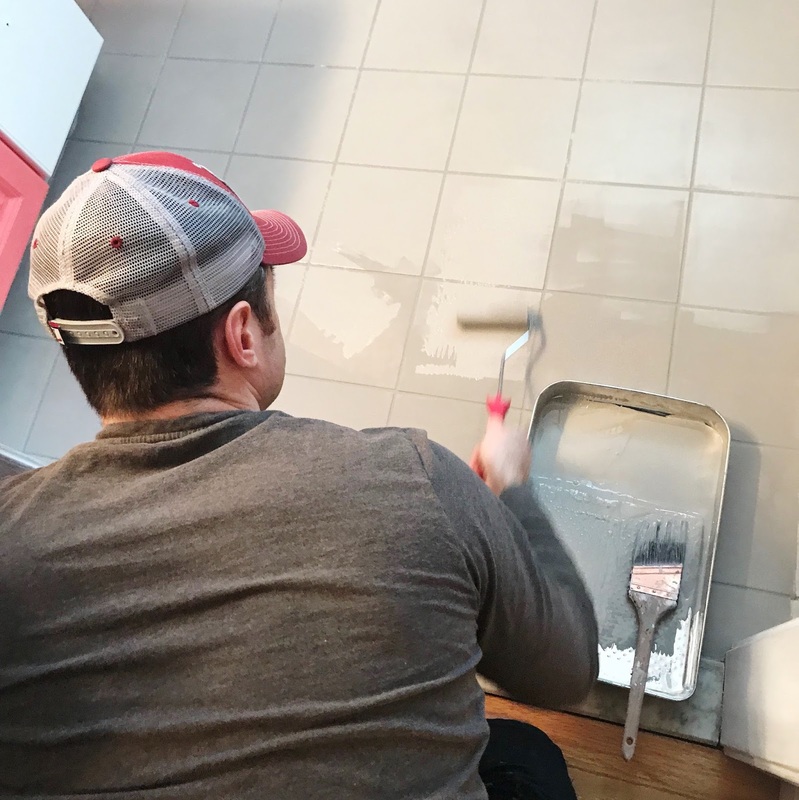 Since chalk paint is hardy we didn't have to prime the floor, we just vacuumed and did some light mopping; you do want to make sure the floor is clean and free & clear of debris. My husband rolled two coats on the floor with a high density (Annie Sloan) foam roller and then applied 2 coats of Annie Sloan lacquer sealant. 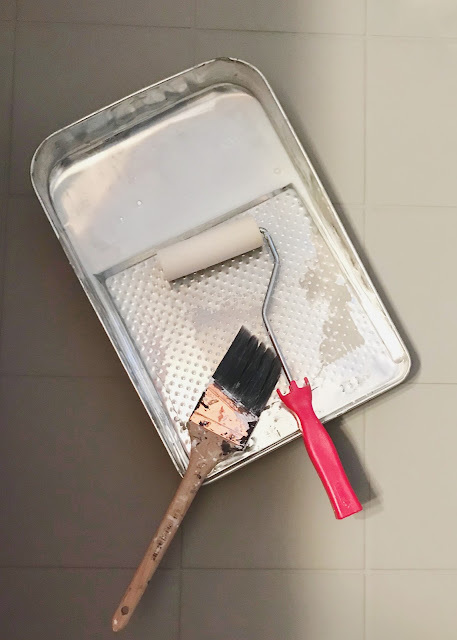 The lacquer went on well with the roller as well as a Purdy Nylon / Polyester brush. It took the paint 30 minutes to dry between the two coats and the lacquer an hour (final coat needs to cure overnight before use). 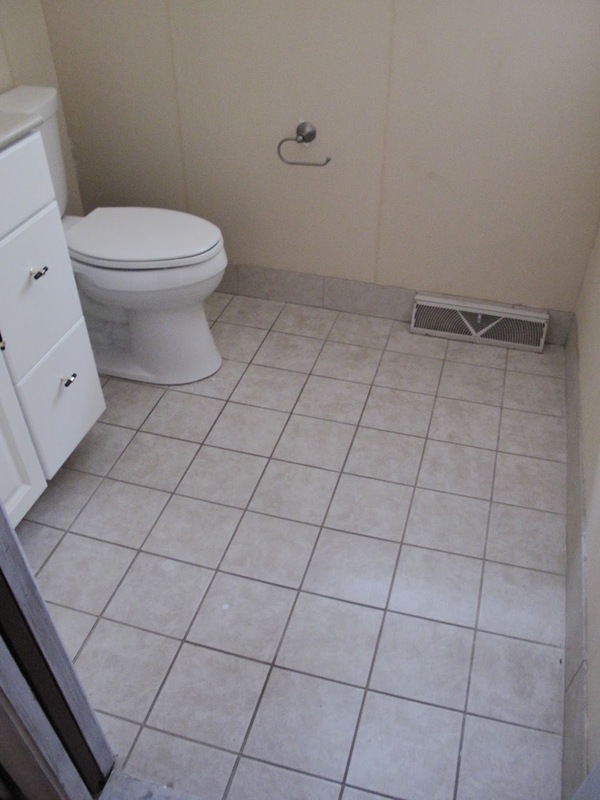 The finished floor with the new baseboards. 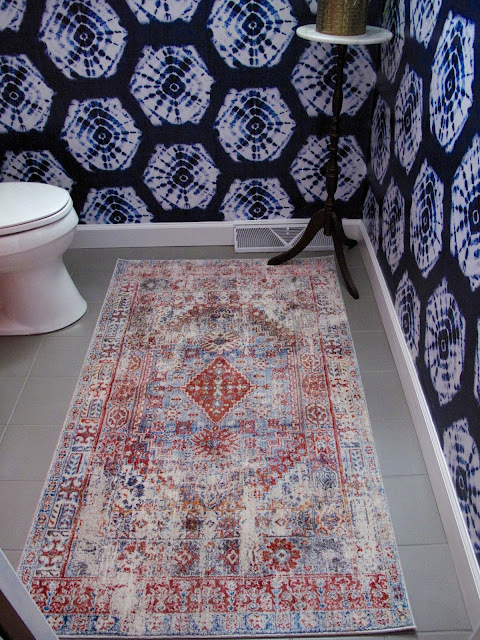 The rug in place from RUGS USA It really ties the floor, walls and cabinet together. 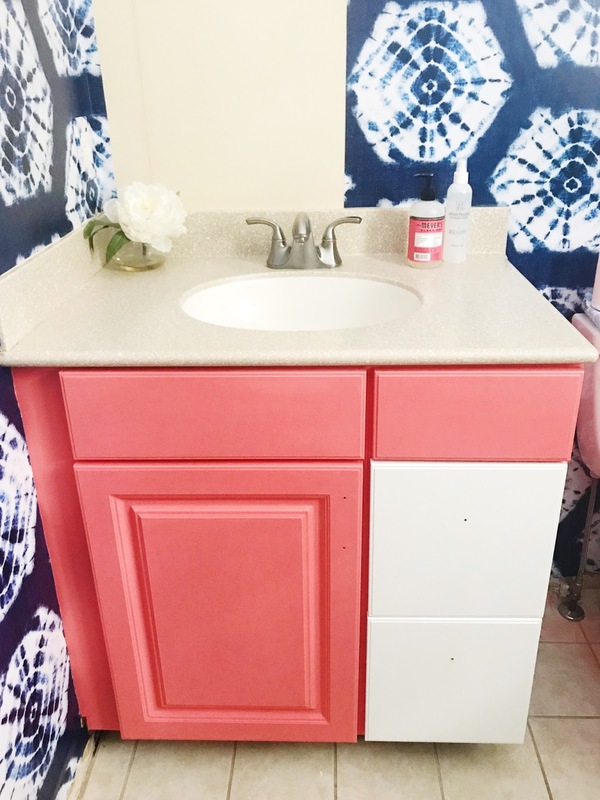 The mister also painted the vanity this week- below a sad before picture- still can't believe how much this space has changed already! 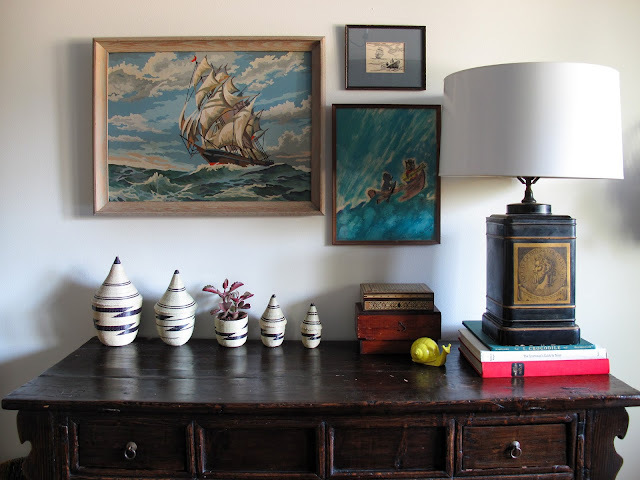 We used Velvet Finishes Paint in Exotic - no primer needed. I sprayed the cabinet with their "ready" spray to prep the cabinets for painting. Super easy! Each piece, frame, doors, drawers, received two coats of paint and then the Velvet Finishes "protect" top coat to seal the paint. TA DA! The paint turned out so well! We are still adding hardware and the lighting goes in THIS WEEK! Stay tuned for more accessory updates! 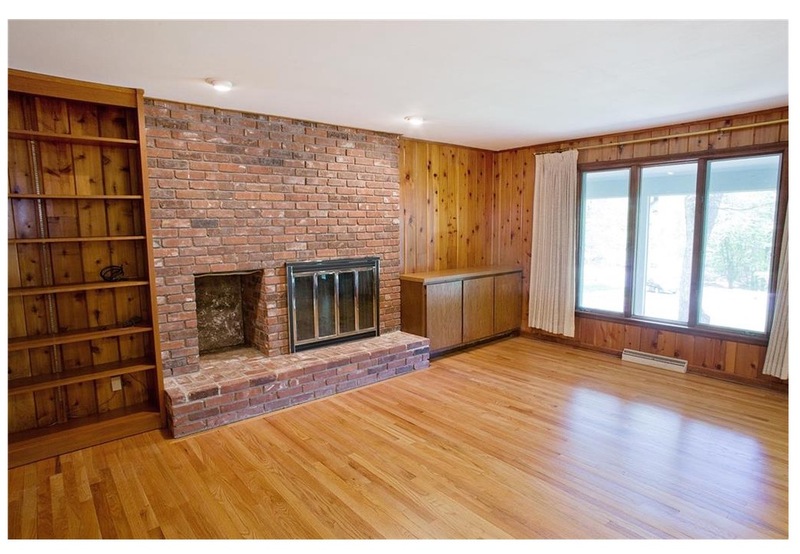 decide if I need blinds? 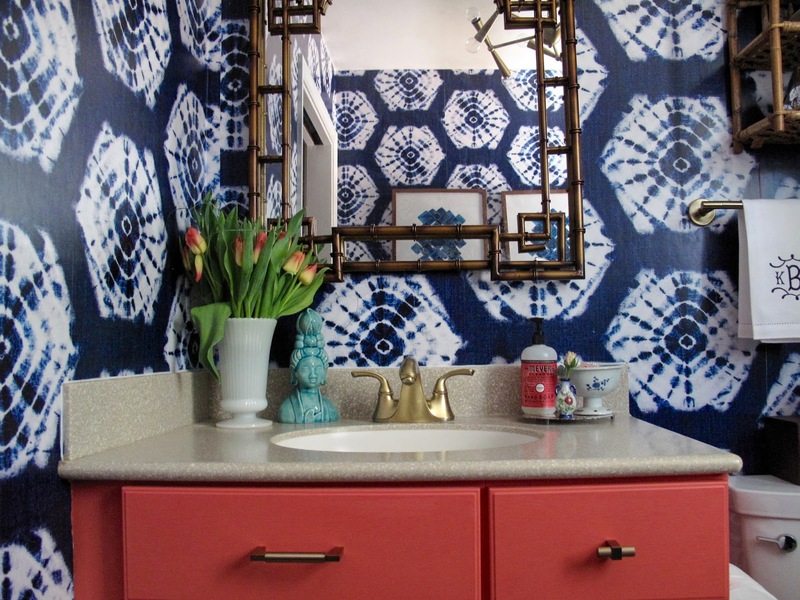 ** The paints used in this post, for the vanity and tile, were sponsored. The opinions about these products are solely my own. AND DON'T FORGET to Check each one of these lovely ladies posts! 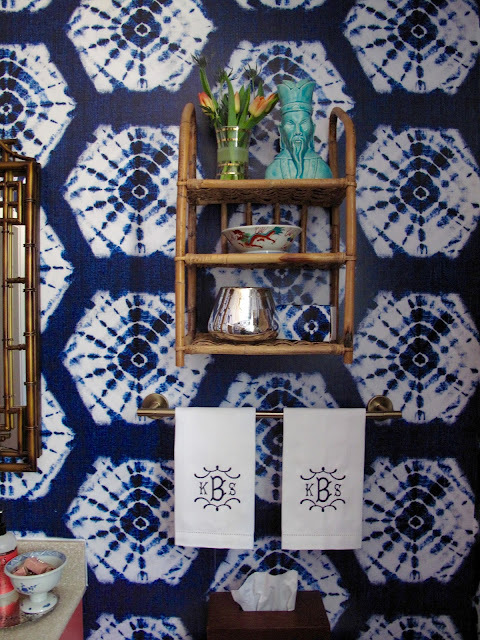 Eliesa is rounding out our tour and has some FAB wallpaper she's revealing this week! See links below. 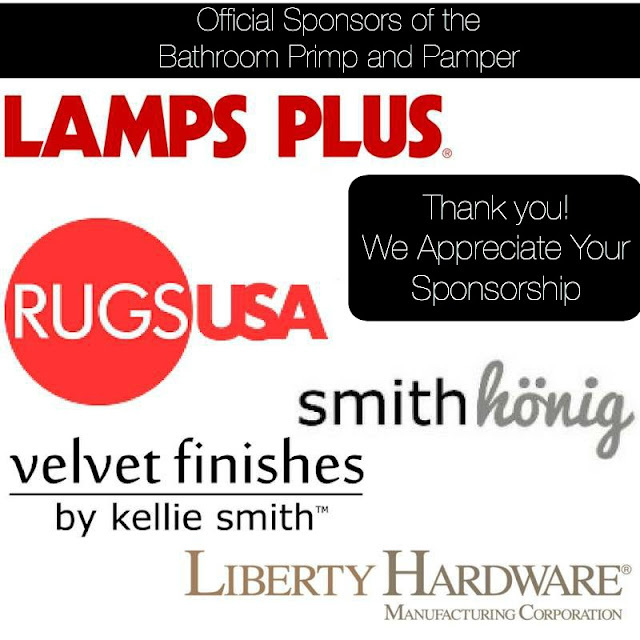 AGAIN A HUGE THANKS TO OUR SPONSORS! Welcome! For those hoping over from Jewel's lovely bathroom posts- Isn't it fun to see her space come along? She makes bathroom updates look easy! Such style she has!! Make sure to check out all the participants - they each have such a unique sense of style. 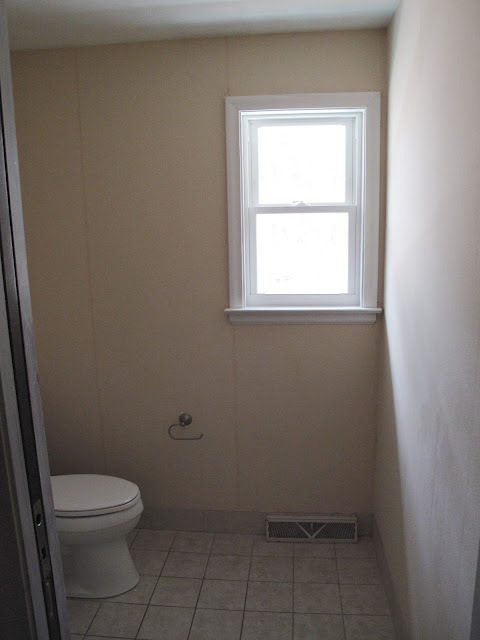 Personally, I'm storing up inspiration for when we take on our guest and master bathroom renovations down the road. A HUGE thanks to Jewel for rounding up our awesome sponsors and for hosting this fun event! I hung this wallpaper with my mother-in-law (and some help from the husband) over the course of 2 days. It took a total of 5-6 hours. I'd say that was mostly because neither of us had used Stick & Peel before. Once we figured out our laying process it went faster. The first panel was fairly easy to hang. We started in the most open easiest spot since we were newbies at peel & stick. This panel helped us figure out how to manage the bubbles and see which direction we wanted to go with matching up the repeat pattern. There are some spots that we didn't get perfectly matched but the paper was easy to move and layer. We were able to go back and fix mistakes after the hanging was complete which is not possible with regular wallpaper. A clean wall, with minimal to no texture, is key for adherence when using stick & peel wallpaper. Hanging stick & peel paper is different then regular wallpaper! So I recommend having help if you have not used this style paper before. Stick & Peel is great for easy removal, temporary spaces and regular spaces-the main difference from regular wallpaper is in the hanging process and glue. There is no water, gooey mess or heavy smoothing out to do with stick & peel and it is much more forgiving over time. 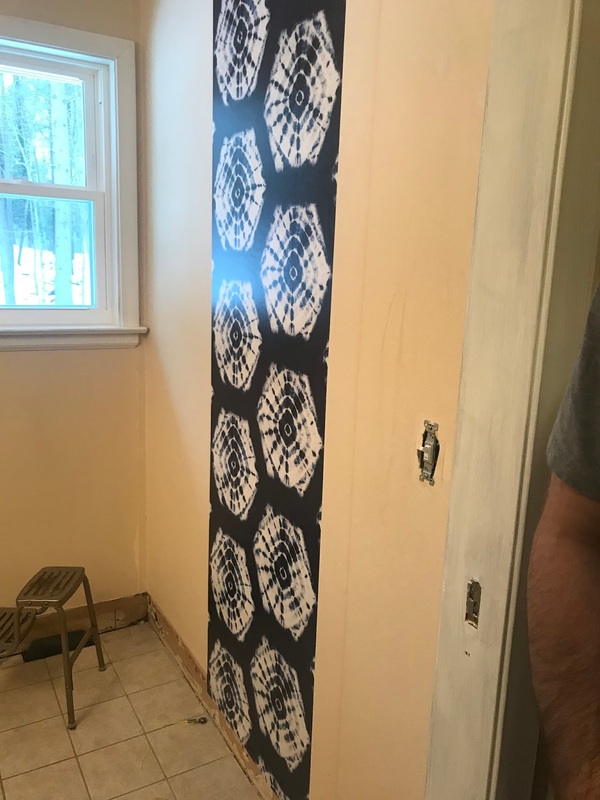 We found the best way to hang the SmithHönig stick & peel paper was too remove the paper backing completely from each panel versus slowly removing one section at a time. Once the paper backing was completely removed we gently started to adhere the paper starting on the left side. We then smoothed the paper from left to right while allowing it to fall naturally into place top to bottom. When we tried to adhere the paper quickly and all from all angles the more bubbles we incurred. Hence letting the paper stick to one side and naturally fall into place as we smoothed across and down the each panel created less bubbles. Since there is no water/glue the bubbles are trickier to smooth out. I found it requires pulling back the panel to readjust versus using a flat edge to smooth out the paper like you would with regular wallpaper. 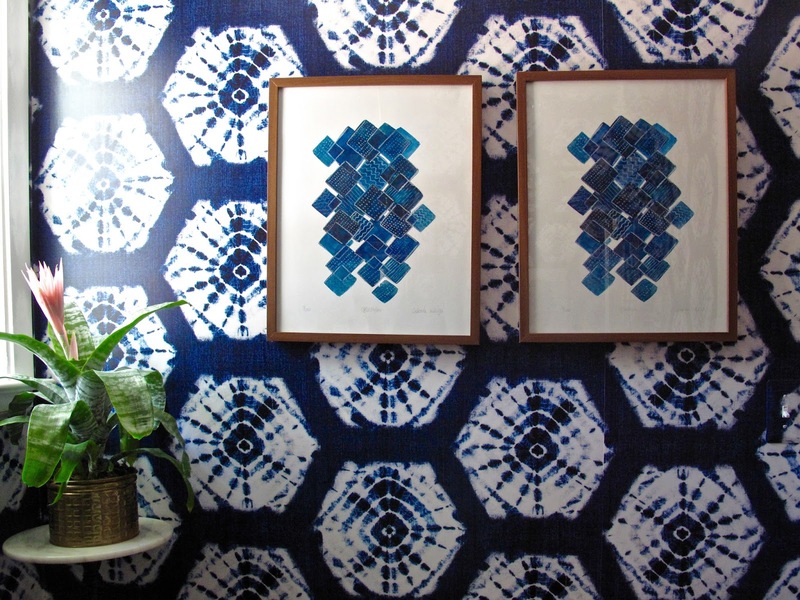 SmithHönig peel & stick wallpaper was very forgiving. I haven't used other peel & stick papers to compare it too but this paper was easy to pull off and on. We had to do the normal amount of repositioning to get the pattern to align correctly and this paper was a champ! We did not have issues with it stretching, losing shape, wrinkling or creasing. All things I was worried about having never used stick & peel. Paint the vanity- the paint arrived yesterday! Hang/add new hardware- it arrives tomorrow!! Add decorative touches- baskets, art, mirror etc! ** The wallpaper in this post was sponsored but all thoughts and options are mine. 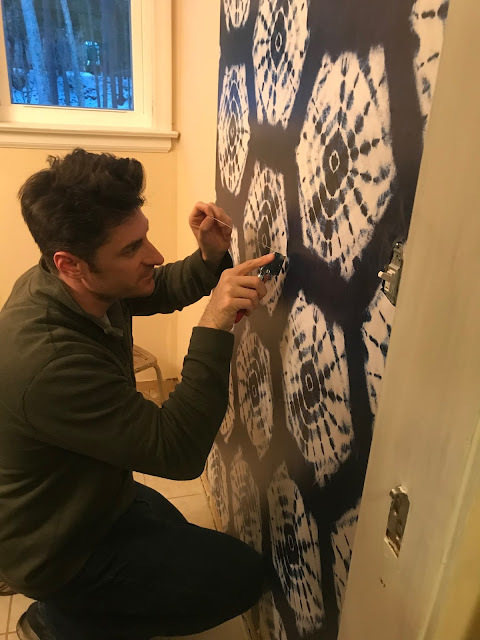 Also, I am not a professional wallpaper hanger- take me tips and tricks with a grain of a salt as I've heard ever peel & stick paper is different depending on the brand. As always a HUGE thank you to our lovely sponsors below!